Taiwan has long been related to technological terms and products. Given such a strong first impression in the past few years, it makes me think if there is any inter-relationship between technology and new media art in Taiwan. OEM (original equipment manufacturer) has been declining, and a huge increase of creative consumption would further stimulate this country to acquire talents from all sorts of fields and industries, namely product research, marketing and interaction design. How much more effort do we really need to put to deepen the belief that new media art really isn’t any of them? Playaround workshop, founded in 2008, educates local people with its core spirit, free, open and share FLOSS (Free / Libre Open Source Software). Applying untraditional methods to sharing knowledge and teaching new media art courses has successfully open up unexpected opportunities for people from different backgrounds. Playaround, Technomad, DIWO Culture and Space Colonization are the previous four workshops that have encouraged local enthusiasts respectively. 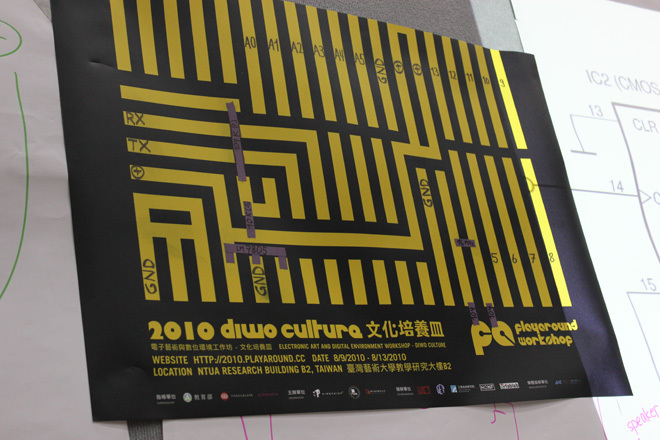 Pure Data, Open Lab and Bioart communities in Taiwan were formerly supported and educated by these free culture workshops. Other than Taiwan, new media art in Asian countries, such as China and Hong Kong, is affected by free culture and transformed into a newborn hybrid. What are the impacts? Would an industrial boom in trends such as Open Space, Hacker Space and Fablab bring in mutually beneficial results? Are we able to rethink and digest the significance and change between technology development, and new media art creation? Escher Tsai, Master of Art History of National Taiwan University of Art. He devotes himself into digital art research, promotion and creation. He was project manager of Acer Digital Art Centre, planner of many digital arts creation and centre, host of Digital art exchange platform, creative director of microplayground. Established by Escher Tsai and Keith Lam, well-known curator and artist from Taiwan and Hong Kong, Dimension+ is a creative team that devotes themselves to the interactive digital environment. We are constantly been generating new ideas that deal with digital and analog technologies. We also dedicate ourselves to digital art education and environment change.